Your home needs to have a certain rate of natural or mechanical ventilation. The air exchange rates are regulated by components in the shell of the home like windows, vents, doors, fans, fireplaces, floors, ceilings, walls; and also by the ductwork (as discussed in the Duct Sealing section). Day Energy addresses all of these facets to work harmoniously, circulating an adequate amount of fresh air, while ensuring decent indoor air quality, combustion safety, energy efficency and proper moisture mitigation. 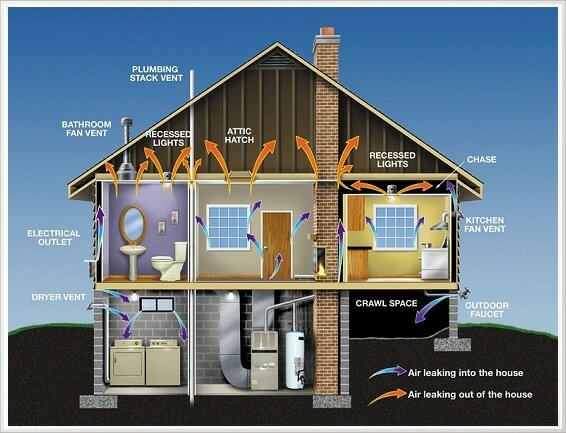 The amount of air leakage occurring in the average home is well in excess of ideal natural ventilation rates. This excessive leakage is often to blame for a variety of residential issues including high utility bills, uncomfortable rooms or zones within the home, and poor indoor air quality. Careless oversealing can also turn a decent performing home into one with numerous issues. Just as excessive house leakage can have many disadvantages, inadequate house leakage (or a home which is too air tight) can be a source of mold, poor indoor air quality, safety concerns and unsafe combustion appliances. To determine if a home is best suited for air sealing or additional ventilation, it must first be tested to make an accurate determination. A calibrated blower door test coupled with a few house-specific calculations are the first steps to gauging a home's air leakage rates and identifying the sources of leakage. A qualified DES technician will conduct the analysis, gather necessary information, provide you with a detailed assessment as well as options for improving your air sealing system.